The Australia Letter is a weekly newsletter from our Australia bureau. Sign up to get it by email. A week has passed since the terrorist attack on two Christchurch mosques that left 50 people dead and wounded dozens more. It has been a week of grief, horror and loss, particularly for the Muslim community, many of whom had made a home in what they believed was a country safe from this kind of atrocity. 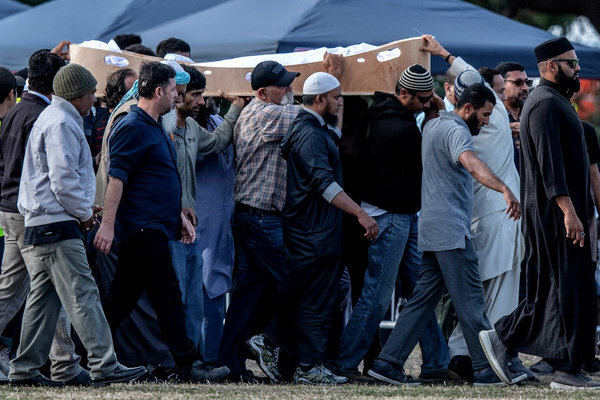 But as people around New Zealand held vigils and grappled with questions about what had led to the worst massacre in the country in modern history, it has also been a week of action. On Thursday, Jacinda Ardern, the country’s prime minister, pledged to ban military-style semiautomatic weapons. As the crisis unfolded, a team of New York Times reporters, including Damien Cave (who normally writes this newsletter), traveled to Christchurch. This week, I asked him some questions about the experience of reporting on such an attack. News of the shooting broke last Friday. Can you walk us through how it unfolded for reporters? When did it become clear that a terrorist attack had happened? Shootings are always hard to cover in the first few hours, when information is often spotty or just wrong. In this case, we were on alert as soon as we heard there was an active shooter, and then over a couple of hours on Friday, it started to look more serious. We’re lucky; we have a fantastic reporter in New Zealand — Charlotte Graham-McLay, who knows the country well and who is well sourced in government. She kept us up-to-date all along the way, and once we heard at least one mosque had been targeted, we started to think this was going to be a big deal. Then the numbers of dead started to climb and that’s when we scrambled to get more people on the ground. Plane tickets were selling out fast and then Christchurch’s airport shut down domestic flights, keeping Charlotte from getting there. Jamie Tarabay managed to get one of the last flights out on Friday; I got a flight for Saturday morning, and by Sunday, we had five reporters and two photographers in Christchurch. Politicians in New Zealand have been discussing gun policy and national security ever since the attacks. Where is the conversation at right now in the country, a week later? On Thursday, Prime Minister Jacinda Ardern announced a national ban on all military-style semiautomatic weapons, all high-capacity ammunition magazines and all parts that allow weapons to be modified into the kinds of guns used in the mosque killings. As an American, the main thing I can say about the conversation in New Zealand is that, so far, it’s been, well, much calmer than the gun debate in the United States. 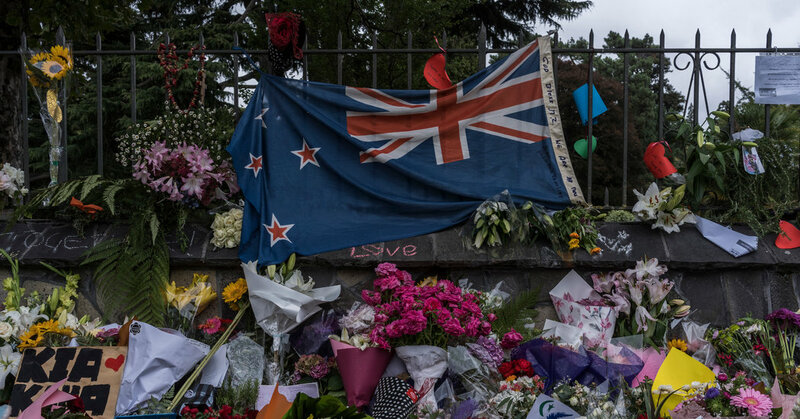 Yes, there are gun lovers here and gun critics, but there tends to be a willingness to adjust the policy in ways that will make New Zealand safer, without as much rancor as there is in America. You attended the funerals for many of the victims and were in the hospital with their families as they waited for updates. Are there particular moments that have stayed with you? Many. But the few hours I spent in the “relatives room” at the hospital was especially powerful. I was pretty much the only reporter there, having walked in with an imam and a family that welcomed me. Inside a cafeteria with gray carpets and closed windows, there were dozens of relatives of the dead, from all over the world, desperately trying to just get information from the police and Islamic leaders. It reminded me, sadly, of my time covering the war in Iraq, when the parents of the missing would often come to the Green Zone seeking information from American officials about sons and daughters who had gone missing in the mess of war. But then, in that drab little room, something amazing happened. When the yelling was at its peak, with different people demanding that officials produce a list of the dead, a man behind me yelled “Allahu akbar” and called for patience — and the crowd calmed down. The Islamic leaders and the police held a meeting and came back and announced to the crowd that they would adjust the process. It was a powerful example of community and nimble democracy — strongest I’ve seen in years. What were some of the reporting challenges you encountered while on the ground in Christchurch? One of the big challenges in an environment like this — a tragedy of global significance — is how to deal with other media and the demands on the people who are affected by the tragedy. There are probably hundreds of reporters here all looking to get the story out to their part of the world, and while many of them are thoughtful, there are always a few — I won’t name names, but some Australians don’t have a great reputation in New Zealand — who err on the side of overdoing it, both with victims and their families, and with others (like gun shop owners) who are more tangential to the story. It’s partly the demands of the news cycle and particular brands (television reporters often skip straight to “how did you feel when …”) and I’m sensitive to the fact that our industry is in flux and people are just trying to do their jobs. But when a handful of journalists lack heart and humanity, it ends up hurting all of us who do what we do. It leads families to see us as the enemy and leads officials to cut off access, and then that means that people who actually want their stories told can end up silenced. I don’t think that has happened too much here in Christchurch, but over time, it’s clear that some families have become more frustrated with some journalists’ behavior and are struggling with whom among us to trust. It means it takes more time and effort to build rapport and tell stories that have nuance and complexity. You can read more about decisions our editors made on how to cover the attack here. You can find an updating list of the victims here. They spanned generations and nationalities. • Quick Action, a Near Miss and Courage: Abdul Aziz was praying in Linwood Mosque when he heard the gunshots. Rather than run from the noise, he ran toward it, grabbed the first thing he could find — a credit card machine — and flung it at the attacker. • In Australian Town Where Suspect Grew Up, Residents Are Stupefied: On Saturday, I went to Grafton, where locals, including former classmates of the man accused of carrying out the attacks, expressed horror. “The town has gone into silence,” a restaurant owner said. • A Mass Murder of, and for, the Internet: “People used to conceive of ‘online extremism’ as distinct from the extremism that took form in the physical world. Now, online extremism is just regular extremism on steroids,” Kevin Roose, our tech columnist, writes. • Artist Says Big Bong Will Help Save a Town. The Locals Aren’t Amused: Australia loves its “Big Things.” But one man’s idea for the town of Woodenbong isn’t exactly popular with residents. This profile of Lupita Nyong’o, however, is a great spoiler-free insight into how the star prepared for her role in the film. • Why Jacinda Ardern Matters: New Zealand’s prime minister is emerging as the progressive antithesis to right-wing strongmen like Trump, Orban and Modi, whose careers thrive on illiberal, anti-Muslim and anti-immigrant rhetoric, Sushil Aaron writes. • Who Do Jared and Ivanka Think They Are? : A new book looks into the Kushner family’s secrets. • My Brother, My Executioner: Racism begins with ideas. It ends with violence, Omar Aziz writes. Our Smarter Living newsletter, if you’re not already signed up, is worth checking out. Every Monday, Tim Herrara, the founding editor, shares thoughts on how to live a better, more fulfilling life. The question at hand this week: how to stop obsessing about missed opportunities and see rejection as an advantage. Unlike other emails, it’s one I really look forward to. Not only are the tips helpful, it’s a positive reminder that we’re all learning — and that self-improvement happens in baby steps. Follow Damien Cave and Isabella Kwai on Twitter: @damiencave and @bellakwai. Next Next post: Jersey Shore’s Pauly D & Vinny Go Shirtless in Cancun!